Jokes are not only a pastime, but a gateway for many people to get into acting like Jerry Seinfeld, Robin Williams, and now James Patterson in his new book I Even Funnier. This book is not only amazingly funny, but can be very serious dealing with sensitive issues. 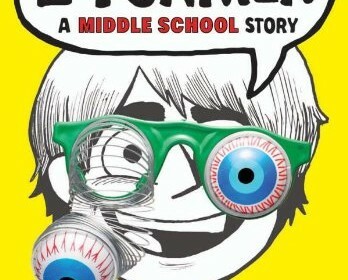 In my opinion, I Even Funnier is an amazing story of a paraplegic boy named Jamie Grimm. He has a likeable personality, with an optimistic attitude, and a pun-like sense of humor that never get annoying to listen to. In fact, he’s so funny that in the first book, he entered a comedy contest which becomes a character vs. self battle that is continued onwards into this story. Jamie now competes against his nervous personality and stage fright to become the funniest kid in the world. One of the many things that I like about this character is how he has a spirit to never give up on his ambitions. The overarching theme is to never give up on your dreams no matter what, which is the personality of Jamie making this character likeable and relatable. Other conflicts are character vs. character with the antagonist, Stevie. He’s the school bully, who is not only Jamie’s cousin, but also his Stepbrother. Though a villain, he seems to be referenced with rumors that are funny, yet scary like: “He once slugged a teddy bear that said the wrong thing when he pulled the strings.” While people like Stevie are out to make life horrible for Jamie, he also has people who are there to make his life better. Jamie has people like his Uncle Frankie to stand by him and help him with not only his goal to be the funniest kid in the world, and to become a better person in general. Uncle Frankie is the owner of a restaurant called: ‘Frankie’s Good Eats by the Sea’. After reading James Patterson’s I Funny, this book helped me discover the growth of characters, shocking twists, and ideals that question a reader’s knowing. Two of its shortcomings are the predictable ending, and the characters like Cool Girl who should be a bigger part of the plot, but once they’re introduced, they don’t appear again until the end. I wanted to see more of Gilda and Jamie’s relationship develop, since it comes out of nowhere. The books characters are very original, and show us how to create a fun personality. While I was finishing it I felt like I just rode a roller coaster, and just like a roller coaster ride, it was a fun experience. This was due to the fact that everything comes flooding back into your thoughts by the end. It made me feel like I was with these characters seeing them grow, but thats my opinion. In conclusion, James Patterson’s I Even Funnier is a comedic piece of realistic fiction for anyone that loves a to here a good plot, fun characters, and more.